MANKATO, Minn.— It was a broiler Sunday in the upper Midwest, 85 with a scorching sun and St. Louis-like humidity that made fans and media at the Vikings’ first day of training camp look for any sliver of shade they could find. Players and coaches, well, they weren’t so lucky. Players wore no pads, but they had helmets, and after drills and short spurts of teaching, they’d remove their helmets and rivulets of sweat would pour off their heads. Pretty good player too. It is silly to judge anything of a veteran football player in an unpadded July practice … except athleticism. 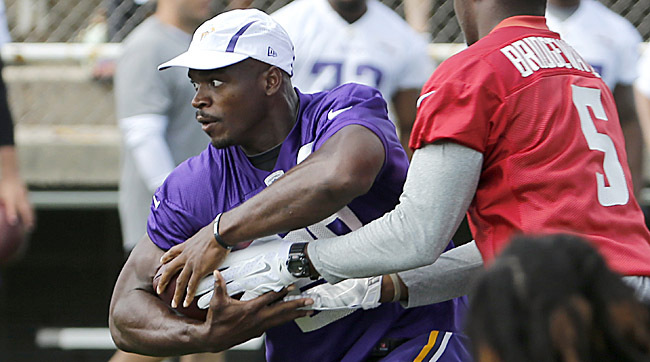 And in the first training-camp practice of his thirties (he turned 30 on March 21), Peterson made one move that showed the Vikings the athleticism they were missing at the position for the final 15 games of last season. Running a seam route out of the backfield on linebacker Brian Peters, Peterson feigned left-right-left in a millisecond and left Peters covering air. Backup quarterback Mike Kafka tossed an in-stride 30-yard touchdown to Peterson. Easy as pie. Followed by a smile. We’ve seen both—the juking move leaving a defender behind, and the smile—before. • We’re new and re-designed. After two years with the mondo home-page photos, we’re debuting a new layout for year three of The MMQB. The short explanation is we want to display more varied content on the home page, but I’ll explain more later in the column. Hope you enjoy it. Let us know what you think. • The MMQB Training Camp Tour is off and running. Including Mankato, we’ll hit six spots in week one as we move down the East Coast and into the South late this week. For the first time, we’ll have a live blog with multiple entries per day, which you’ll be able to access from our new home page. Later today, look for a one-question video interview with Vikes quarterback Teddy Bridgewater, my video thoughts on the Vikings and our first of 32 training camp reports—on the Vikings, of course. Plus there might be some news about walleye-eating. Then we move onto Latrobe and the Steelers today. • News abounds. Thoughts on Russell Wilson’s contract stalemate, the Junior Seau Hall speech controversy, the release of some good players, Jason Garrett on the eve of a surprising Dallas record, the Steelers with a half-century of stability, the long and strange NFL trip of Matt Cassel, a 95-year-old beacon for our business, and why the NFL hired a chief operating officer. • One more thing. Do not bring your drone to Steelers’ camp. It will not be welcome. Now back to the return of the prodigal, and chastened, son to the Vikings—and what it means to the NFC pennant race this fall. Early in the off-season, I thought Peterson had played his last game with the Vikings. He inferred he wanted out. 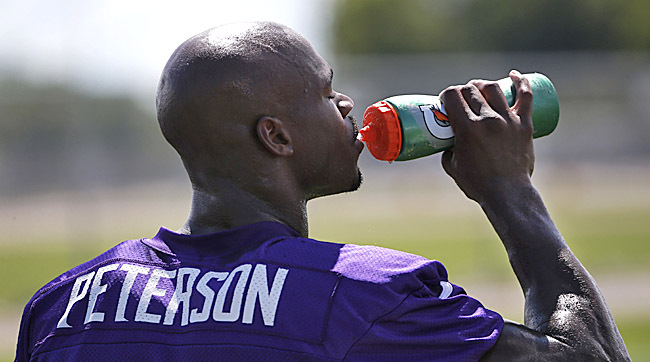 His agent, Ben Dogra, made it clear he was trying to get Peterson a fresh start somewhere else. After being put on the Commissioner’s Exempt List—a paid 15-game vacation from football—for most of last season when he was investigated for whipping his four-year-old son excessively with a tree branch, drawing blood, Peterson entered 2015 with an uncertain future. Even after being reinstated to football in April, the question was: Reinstated to which team? Where would he play? “The reality, and just to be straightforward with you … I knew I really wasn’t going anywhere,” Peterson said. “I am the type of person that likes to look at things from different views, so I put myself in the Vikings situation—the owners, the head coach. [Their attitude was,] We’re not gonna let you go. I revert back to the Percy Harvin situation. Me, if I was the owner of the Vikings, there’s no way I would have let him go. [Wide receiver Harvin was traded to Seattle in 2013.] But unfortunately for us, he ended up leaving—but that’s the way I would have looked at it. I made this point to Zimmer—even if the Vikings were able to get a low first-round pick for Peterson (dubious, given what he was owed on the last three years of his contract), how could they have gotten close to equal value for him? Say the Vikings wanted a running back. The two big-timers were gone in the first half of the first round—Todd Gurley to the Rams at 10, Melvin Gordon to San Diego at 15. Minnesota, if it picked a back to replace Peterson, might have been left with an Ameer Abdullah. Or Duke Johnson. And what pressure there would have been on that guy at this camp. One more football issue: turning 30. That’s always been the line of demarcation, the time when so many running backs have begun to fall off a cliff because of years of beating on their legs and shoulders and feet. Peterson, as he mentioned earlier, isn’t buying it. We’ll see. The team certainly seemed to be back in love with him Sunday. Team passer ratings, 2009-11: 76.7, 72.1, 77.6. Wilson passer ratings, 2012-14: 100.0, 101.2, 95.0. Judging the market for any player is always problematic. Complicating this process is the fact that Mark Rodgers, who represents Wilson, works mostly with baseball players and is an unabashed fan of unrestricted free agency. Surely he has been agreeing with Wilson when Wilson clearly wants to bet on himself. In other words, Wilson will risk injury in the next two years—the Seahawks will likely apply the franchise tag to Wilson for 2016, at approximately $25 million—if there’s not a contract the two men deem market-worthy. And on the injury risk: When’s the last time a good or better-than-good quarterback in his prime suffered an injury so severe he couldn’t return from it? Maybe Joe Theismann? Surgeons are good these days. They repair players. I wouldn’t let the threat of injury drive me to sign a contract I didn’t think was fair. Is five years at $22 million per so drastically out of whack? That’s the current champeen of NFL contracts. Aaron Rodgers signed it two-and-a-quarter years ago with the Packers. The salary cap when he signed, in 2013, was $123 million. Now it’s $143.8 million. Rodgers’ Packer contract in 2013 was, on average, taking up 17.9 percent of the Green Bay salary cap. An equivalent contract today, when the cap has risen to $143.3 million, would be $25.6 million annually. So paying Wilson $22 million a year would seem to me a pretty fair deal. Even $23 million per would arguably be right—and if the Seahawks choose to wait until 2016, there’s no way the price is going down by then. What if the Giants pay Eli Manning $23 million per? 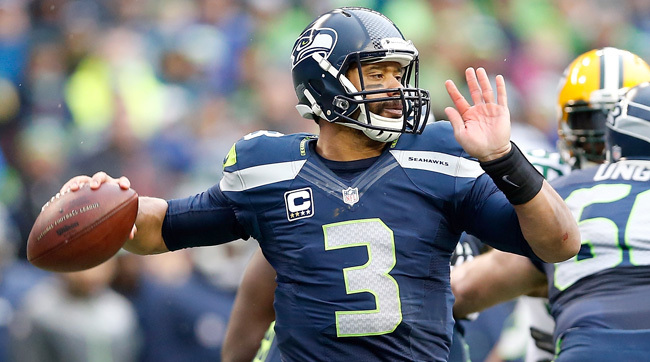 Finally, whatever Seattle offers Wilson—and Pro Football Talk pegged the latest offer at $21 million per—he’s still going to be a bargain over the first half of his career. Let’s say the two sides agree on Rodgers money: five years, $110 million, with guaranteed money being paid this year but the 2015 salary staying on the books for cap reasons. (Not likely, but possible.) Check out how Wilson’s total compensation in his first nine seasons would compare to a player who hasn’t won as much but who was rewarded this off-season, with no hue and cry about the deal not being worth it. You make the call. It doesn’t seem a stretch to me to pay Rodgers money to Wilson, no matter what you think of the two men as players. • Meet Wilson’s Agent: Andrew Brandt with an in-depth look at Mark Rodgers, the “baseball agent” negotiating for Wilson. Plus, a look at Wilson's contract situation. Mike Pereira breaks news about the new system of measuring air pressure in footballs. Pereira, the former officiating czar, wrote the story for FOXSports.com Sunday. It’s waaaaaaay complex, so I shan’t go through every aspect. But this is one I find most interesting: When footballs are pressure-gauged before games, they will still have to measure between 12.5 pounds per square inch and 13.5 psi. If they do not, the officials will be instructed to put the air in the football at 13.0 psi. So if one team is trying to get an edge by having the pressure right on the border near 12.5 or right on the border near 13.5, and it’s either under or over by a tenth of a pound, it will backfire. In the past, maybe a crew would measure and say, “Close enough.” Now, that crew will have to put the psi at the halfway point between high and low, exactly 13.0. In other words, it’s a decision soft-ball lovers or hard-ball lovers really won’t like. Two good players are on the street, both surprises. 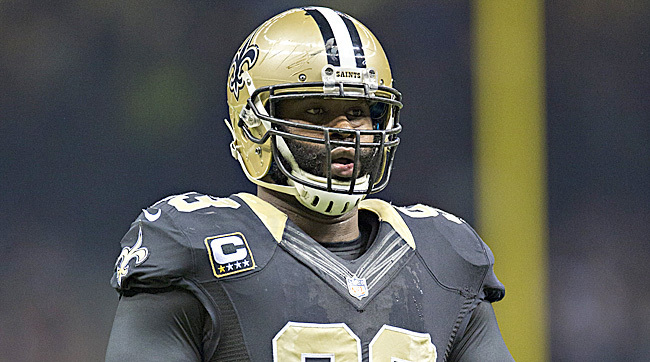 One of the best edge-rushers in football, Junior Galette, was informed Friday that the Saints would be releasing him. And Sunday, the Colts released their presumptive starting right tackle, Gosder Cherilus, apparently because they were skeptical he could stay healthy. Galette’s story is the latest example of the debacle that the Saints’ salary cap situation has become. He was arrested on a domestic violence charge, but the charges were dropped. And he was accused of hitting a woman with a belt during a brawl captured on video. Galette met with league officials recently, but no decision has been forthcoming on whether he would face league discipline stemming from either incident. For the Saints, firing a player just 10 months after handing him a $41-million deal over four years is a deathblow to a team trying to get out from under an avalanche of shaky contracts. Incredibly, New Orleans will have $17.55 million less to spend on its cap in 2015 and 2016 because of the Galette deal. Put another way: Eight percent of the Saints’ cap in 2016 will be spent on a player who didn’t even make it to training camp for them in 2015. For a team trying to recover from some weighty deals, Galette’s firing could result in a major competitive disadvantage in 2016. So, why the change? The induction ceremonies had become quite long and tedious. In 2009, when the late Derrick Thomas’ designated speaker, Carl Peterson, rolled on for 26 minutes in his pinch-hitting acceptance speech (and Chris Berman went long in introducing Ralph Wilson that year too) both the Hall and network officials thought the speeches had to be reined in. So the video introductions were made to feature the chosen presenters, and then the presenters would not speak live; and the acceptance speech the Hall would ask to be shorter would follow. If an inductee had died before the ceremony, there would be an introductory video and then the unveiling of the bust by family members. That happened in 2011 with the late Bill Stanfel. For those inclined to blame commissioner Roger Goodell for the change, Hall VP Joe Horrigan said over the weekend that Goodell had nothing to do with any procedural decision like this one. For the conspiracy theorists saying the league wouldn’t want discussion of suicide or head trauma to roil Hall of Fame weekend and thus the league put the kibosh on any Seau speech … well, if this were the first time an inductee’s family hadn’t been allowed to speak, that might be understandable. But it’s not the first time. Horrigan told me he talked to Sydney Seau after the Times story came out, and she said she was all right with the Hall’s decision. Longtime Hall voter Jim Trotter, who covered Seau on the Charger beat, knows the family well and is the author of a Seau book due out soon, tweeted that Sydney was O.K. with the Hall’s call. In the video, by the way, she speaks often, and ends by saying—and I’m paraphrasing, but it will be something close to this—Now it’s my honor to present my father, Junior Seau, for induction into the Pro Football Hall of Fame. You may want to hear more than this, and you may want a member of the deceased inductee’s family or a close friend to give an acceptance speech. Especially if Seau-loving San Diegans journey across the country to see the ceremony, I understand that they’d want more than a videotaped introduction and an unveiling of the bust. But the reason for this decision is brevity, not a problem with what would be said by Sydney Seau. That’s always good news. The MMQB team kicked off the tour on Sunday in Mankato, Minn., with the Vikings (as you can see by page one of the column). I’ve got a few announcements to make, as well as running our camp-visitation schedule. • Tweetups. We will have one in Wisconsin, probably on Aug. 7. Leaning toward Milwaukee late on that Friday afternoon, but we’ll let you know as soon as we firm up details. I hope to have another one sometime on this tour. Stay tuned, and follow my Twitter feed (@SI_PeterKing) for details. Tweetups, for those unfamiliar, are pretty simple affairs. I show up somewhere—a bar, coffee shop, ballgame, training camp—and you come by and we talk for 60 or 80 minutes. (And, of course, you buy me a beer or a latte.) If you have ideas or proposals for one, send them along to us at talkback@themmqb.com. Hope to see you on the trail. • Our Training Camp Blog kicks off today. The blog, curated by our Emily Kaplan and Kalyn Kahler, will include reports from all 32 teams between now and the end of August, as well as observations from the road, video features and dispatches from our favorite spots along the tour. Follow @TheMMQB for the latest links, or simply come to the home page of our redesigned site starting this afternoon to follow the blog as we update it two, three, four times a day. • Now for the schedule. Keep in mind it was made with a pencil. Adjustments could be made. If you don’t see your team on this list, it’s being covered by another member of The MMQB staff—Jenny Vrentas, Andy Benoit, Robert Klemko or Emily Kaplan. But we decided to make a change. Mostly, I think, because I wanted us to be more diverse, particularly on our home page. Under the old system, we’d rotate four major stories on a timer. If you came to our site, you’d see one story; if you didn’t want to read, say, about Philip Rivers and the Chargers, you might hit another football site before the next story rotated in. Now, without scrolling “below the fold” on your screen, you’ll be able to see a main story in large view—and you’ll be able to, for instance, know where The MMQB Training Camp Tour is stopping today, with a link to our camp blog; you’ll find a Tweet or Quote or Stat of the day; you’ll see headlines for all the stories in the last couple of days on the site; and you’ll see the date. We’ll be nimbler, able to update pages more often. Soon, you’ll find better photo/gallery pages and slideshows, and more prominent places for our videos. And I think the mobile experience will be better too. We want to be responsive to your thoughts. I hope you’ll like it. Please send your reactions to talkback@themmqb.com this week, and we’ll be attentive to all critiques. I want to thank Mike Phillips, Alex Charalambides and Harry Hope for their painstaking work on the project; Alicia Hallett and Lou Gubitosi and their terrific SI design team; SI.com’s Ben Eagle for unselfish training work for our editors; executive editor Mark Mravic for his long-term commitment to the project; and editors Gary Gramling and Matt Gagne, plus writer Emily Kaplan and editorial assistant Kalyn Kahler, for their assistance in getting it to the finish line over the past week. Thanks, too, to our big boss, Paul Fichtenbaum, for making this a priority at a time when the company budget is being pushed and pulled in multiple directions. Thank you, one and all. We’re a test tube, really. We’re just trying to make the football experience better for you so you come to the site more often and stay longer. Thanks in advance for telling us the unvarnished truth of what we need to know to be better. The family, Belson reported, was surprised and dismayed that Seau’s daughter, Sydney, who had planned to give a speech on behalf of her father (per his pre-death instructions), will not be allowed to give that speech at the Hall ceremony. “To not be able to speak, it’s painful,” Sydney Seau said to Belson. When Jason Garrett coaches the Cowboys in Game 15 this year at Buffalo on Dec. 27, it will be his 89th game as the Dallas head coach, including postseason. That will make him the second-longest-tenured coach in the 56-season history of the franchise. Jimmy Johnson coached 88 games for the Cowboys, Barry Switzer 71, Bill Parcells 66. I guess Jerry Jones wasn’t kidding a few years ago when he said Garrett would be his franchise coach. Still, Garrett will have a bit of a ways to go to catch Tom Landry, who coached 454 games for the Cowboys. For the record, the Texans have had four coaches in their 13 seasons; Jacksonville has had five coaches in 20 seasons; and Carolina has had four in 20 seasons. The recent champions of transience, the Browns, have had eight coaches in the 16 seasons since the franchise was reborn in 1999. When Mike Tomlin finishes his current contract coaching Pittsburgh in 2018—if he does, of course—he will be 46 years old, and he will have coached the Steelers for 12 years. One other interesting tilt, this season: In Aaron Rodgers’ first season as Brett Favre’s replacement (2008), he and the Packers routed Peyton Manning and the Colts 34-14 at Lambeau Field. The two quarterbacks have not played each other since. In Week 8 this year it’s Rodgers at Manning (presuming good health for both) on a Sunday night in the shadow of the Rockies, the second and very possibly last time these two will ever meet, barring a move of Manning to the NFC very soon. Like, in 2016. Thanks for the tip on this, Jay Skurski of the Buffalo News. You Tweeted the bit about the coordinators; I added the fact that only once in those eight seasons has he had the same quarterbacks coach two years in a row. Cassel’s going to have one heck of a quarterback-coaching book in him if he ever wants to write one. Went to Yanks-Twins Saturday night at lovely Target Field. 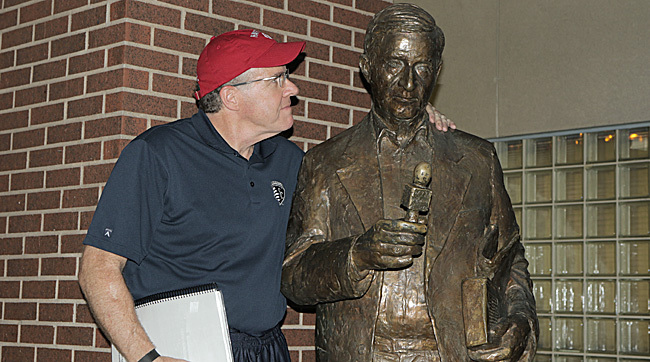 While there, The MMQB’s John DePetro took a photo of me with the bronzed Sid Hartman. In case you don’t know Sid, he’s one of the legends in the media business. Not just in Minnesota, but in America. He is 95. He wrote his first column for a Minneapolis paper in 1945. He wrote his latest, 70 years later, on Sunday (“Sundays With Sid”) for the Minneapolis Star Tribune. At 9:30 a.m. Sunday, he did his weekly radio show on WCCO-AM, previewing the Vikings season, in part, with Vikes GM Rick Spielman. The column was about 1,500 words long. In one item he reported that the University of Minnesota was soon to begin construction on a $1 million batting cage for the baseball team, and that $500,000 was coming from a generous donation by Twins closer Glen Perkins, a former Gophers hurler. I just am so impressed that Sid Hartman, 95, statued in bronze near Target Field, is still doing the job, and is absolutely not mailing it in. Attn fans/media: Drones are NOT permitted at #Steelers Training Camp. Please adhere to this policy & enjoy the experience @MySaintVincent. Pittsburgh director of public relations Burt Lauten, in what has to be the first message to visiting media to leave their drones at home when they attend an NFL training camp. —Longtime Saints beat man Mike Triplett following New Orleans’ release of Galette. Galette was not well liked by some former teammates, and that’s putting it mildly. Smoltz used his HOF speech to rail against specialization in youth sports. "Tommy John is an epidemic. Baseball is not a year round sport." —Lindsey Adler of BuzzFeedNews, on new Hall of Famer John Smoltz’s criticism of overly competitive youth sports. 2. 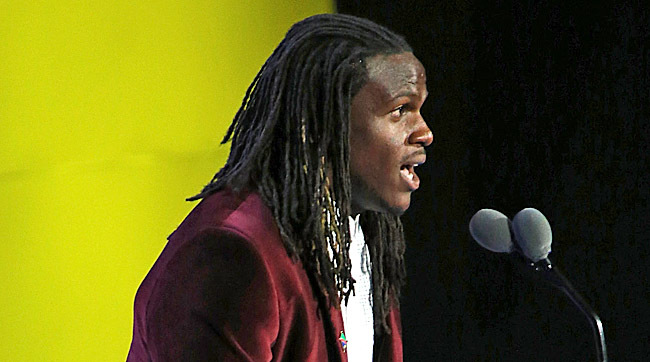 I think Jamaal Charles of the Kansas City Chiefs should take a bow. Over the weekend in Los Angeles, he spoke to the Special Olympians gathered in Los Angeles for the Special Olympics World Games 2015. “I had a learning disability,” Charles told the crowd of athletes and their supporters. “People made fun of me. They said I would never go anywhere. But I learned I could fly. When I was 10 years old, I had the chance to compete in the Special Olympics.” What a tremendous and moving moment he created for the worthy competitors hanging on his words. 4. I think I really enjoyed Seattle wide receiver Ricardo Lockette’s piece for The Players Tribune on how the last pass of the Super Bowl has haunted him this off-season. It was Lockette, running the quick post at the Patriots’ one-yard line, who thought he was going to catch the winning touchdown pass, only to see New England rookie Malcolm Butler jump in front of him to steal it. Wrote Lockette: “People would come up to me after we lost and be like, ‘Well, you know, Malcolm Butler made a perfect play. You just gotta tip your cap to him.’ That’s ridiculous. That’s like saying someone shot your brother, but it was a really good shot. It doesn’t make it hurt any less. Nothing can take the pain away except getting back there and winning another Super Bowl. I’m lucky to have a tight circle around me, but this off-season was really, really tough. I had nights where I just stared at my bedroom ceiling.” It’s a funny thing. You hope players take losses that hard. Not all of them do. But I read this piece and really like Lockette’s view—a guy who entered the league as a free-agent, had a few shining moments, and then, in the biggest game of his life, on the biggest play of his life, the quarterback calls his number, and he’s looking the pass into his hands, and he’s sure he’s going to catch the winning touchdown pass in the Super Bowl. Then the next thing he knows he’s laying on the ground and Butler’s got the ball in his hands and Lockette sees Tom Brady dancing around like a crazy man. It has hurt Lockette the entire off-season—and he said in the piece he appreciated Wilson saying to him on the team’s off-season training trip to Hawaii that he’s coming back to Lockette in a similar situation this year. 5. I think it’s amazing that Peyton Manning has never been to the Pro Football Hall of Fame. He’ll go now, to see his former Colts GM, Bill Polian, inducted on Aug. 8. That’s a good thing. But I’ve not met a player with more reverence for pro football history than Manning, and this is his first visit? Surprising. 6. I think if I’m Saints owner Tom Benson, I’m asking GM Mickey Loomis—if I haven’t asked him already—about the incredible Junior Galette contract that’s going to bite the franchise hard the next two years. Loomis has done a very good job overall over the past decade in resuscitating a moribund team and stocking it with Super Bowl talent. But this four-year, $41 million contract ends up being a killer just at the time the Saints desperately needed reason in their contractual realm. Now: I’m not suggesting the Saints should have carried Galette if they knew the reports of his abusive off-field incidents were likely to be true. I’m suggesting they should have been smarter in the first place before giving a risky (but very talented) player so much guaranteed money. 7. I think for those who wonder why in the world the Rams—with a civic community willing to do far more right now to build a new stadium for the team in St. Louis than either San Diego or Oakland is willing to do for their teams—are the favorites to move to Los Angeles, the answer really is quite simple. The owner wants to relocate his team to L.A. There’s nothing bad about St. Louis, nothing wrong with the city—except it has a much lower ceiling for profits, obviously, than the second-largest market in America. Stan Kroenke is a businessman, and he wants to relocate his business to a more lucrative market. 8. I think it’s going to get overshadowed by the weight of 32 training camps being in full swing, but there’s a pretty significant NFL meeting Aug. 10-11 in the Chicago suburb of Schaumburg, Ill. That meeting will force the sites with long-term NFL stadium plans to show their hands. The people I speak to think the meeting is biggest for the group representing Carson, Calif., group, where the Chargers and Raiders have proposed to build a new stadium in tandem. The Rams’ site in Inglewood, Calif., is further along in planning and vision. Carson need to show, without question, that it can produce a world-class stadium by 2018 or ’19, I’m told. The best thing the Chargers/Raiders Carson plan has going for it is the involvement of former 49ers and Browns executive Carmen Policy, who is expert at seeing and sidestepping the land mines associated with a complex league project. Smart move by those two teams, and the site. 9. I think Josh Freeman—cut by the Dolphins on Friday, probably ending any shot of a further NFL career—will look back on his career one day and say, “I should have worked harder.” Especially in Tampa Bay. But when you sign with the Vikings in 2013, and it lasts one game; and when you sign with the Giants in 2014, and it lasts five off-season weeks; and you sign with the Dolphins in 2015, and it lasts 10 off-season weeks, and you’re cut on the eve of training camp, at age 27, with Matt Moore the backup who has beaten you out … the message is pretty clear. Freeman was talented enough. But beginning with the Greg Schiano Bucs, he just didn’t dedicate himself to football the way a starting quarterback should. b. Congrats to the baseball Hall of Fame guys, particularly Pedro Martinez. I’ll always think the Red Sox could have had another World Series title if Grady Little didn’t manage the 2003 series against the Yankees scared, and had taken Pedro out when he should have. Like, at least four batters earlier. But what Martinez did for that franchise was monstrous, and he deserves every bit of praise for helping a team that was always knocking on the door to take the final step toward a championship. i. Beernerdness: Farm Girl Saison, Lift Bridge Brewery (Stillwater, Minn.). The Saison has become my second-favorite beer, next to the white beers (Allagash White, Avery White Rascal, i.e. ), and this one, straight from the third-base line of Target Field on Saturday night, was a nice surprise. A distinct clove and wheat taste, and in no way overwhelming. Strongly recommended, even when the third A-Rod home run threatened to ruin the evening. The Farm Girl actually saved it. j. Lou Lamoriello is 72 now, and I doubt his best days are ahead of him. But as a middling hockey fan who got turned on to the game in a big way once I moved to New Jersey in the mid-’80s, I want to thank Lamoriello for creating a contender and three-time Stanley Cup champion by his sheer force of defensive will. Eight of 10 North Jerseyans loved the Rangers, not the Devils, and to see Lamoriello’s creation, led by Martin Brodeur, beat the Rangers year after year was a David/Gioliath thing all the Jersey transplants really ate up. Lou was a worker bee who created a worker-bee team, and I hope he can do the same thing with the Maple Leafs, who this fall enter their 50th season without a Cup. k. Thanks for the memories, Lou. They are indelible. n. Good luck, Bernie Miklasz, in your move from St. Louis Post-Dispatch columnist to radio-show host in St. Louis. Do us a favor: Write, still. And write a lot. We need you in the business.